Today we visited the Fermi National Accelerator Laboratory (Fermilab). Besides being home to the world’s largest particle accelerator currently in use (LHC is out of commission until at least this fall), Fermilab maintains much of their 6800 acre site with a variety of natural habitats for wildlife. 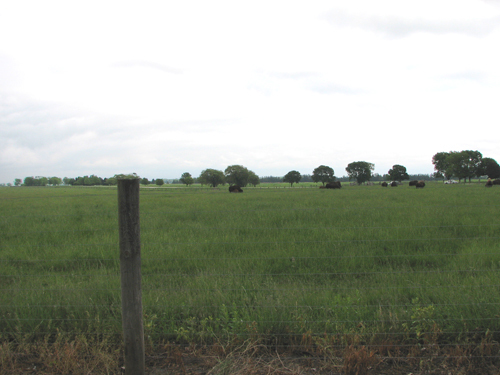 This includes restored grassland prairie – once a major habitat across much of Illinois and the midwest, and former home to tens of millions of American Bison. Today, Fermilab is home to a small herd of bison. 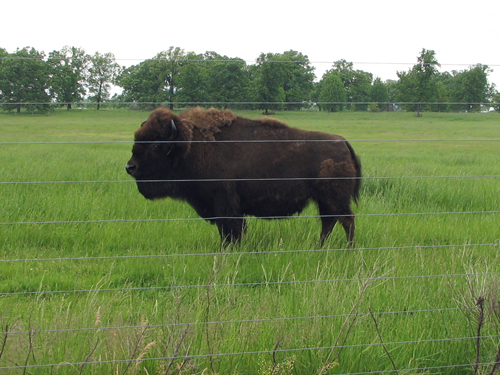 Today over 70% of extant American Bison have been raised for human consumption. Large herds of free roaming wild bison can only be found in a few protected areas in North America, including Yellowstone National Park and Alberta’s Elk Island. 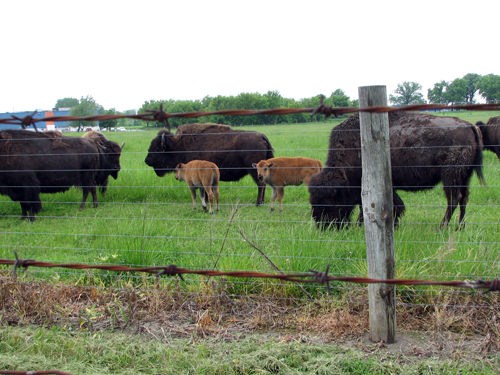 Five bison were brought to Fermilab by the first director, Robert Wilson, in 1969. In 1971 the herd increased by 21; today’s herd at the lab are descendants of those first 26 animals. Our first view of the bison was from a parking lot off the bison field. It was a wet, gloomy day and the buffalo were hard to get a good look at without binoculars. We drove to a small parking area off the main road where the bison were standing closer to the double enclosure fence that separates them from the public. Look at this big guy! 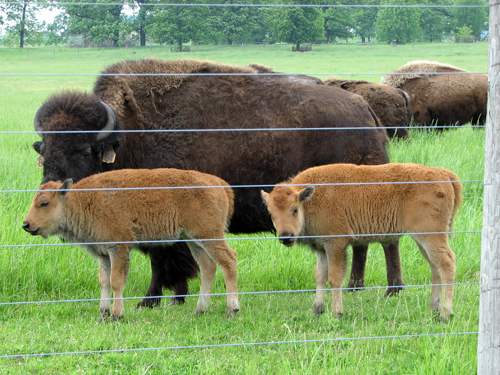 During our tour we learned that there are now six bison calves with the herd. We saw five of them, including what looked like 2 sets of twins. 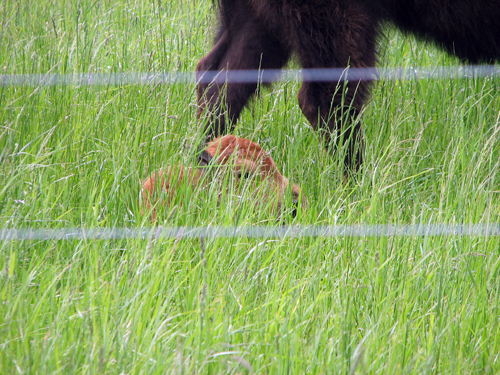 The fifth baby was resting in the tall grass. Our visit to the lab included an awesome tour – more about that soon! If you want to learn more about the bison at Fermilab, there is a lot of information on their website, including these links: Fermilab Bison and Prairie Info; Fermilab Bison: a Prairie Native; and Why are there Bison at Fermilab?. This entry was posted on Wednesday, May 27th, 2009 at 11:14 pm CET and is filed under Environment, Illinois, Nature	with tags . You can follow any responses to this entry through the RSS 2.0 feed. You can leave a response, or trackback from your own site.